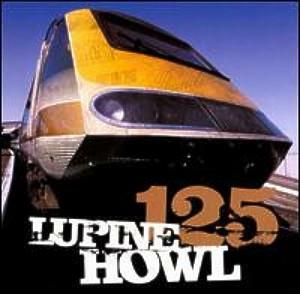 Lupine Howl - "125 EP"
When Jason Pierce fired guitarist Mike Mooney, bassist Sean Cook, and drummer Damon Reese from England's Spiritualized, they decided to continue on together as their own band, calling themselves Lupine Howl. After three singles, the group released their first EP, simply titled 125. Fans of Spiritualized may hear a little of that band's blissed-out "Ladies and Gentleman, we are floating in space" sound, but Lupine Howl, with its mix of neopsychedlia, funk, electronica, and Krautrock, tends to sound more like Primal Scream, circa the Vanishing Point era. Amidst the throbbing bass and drums, guitars shriek and buzz, synths gurgle, swirl, and wail, but Mooney and Cook's vocals remain tranced out, as if drugged. Originally singles released before the EP, both 125 and Vaporizer are rockers bristling with energy. Tired and Swell are moodier pieces. Tired is, appropriately, a somnambulant and floating track, with slide guitars slicing through it. Swell undulates back and forth between waves of deep sound, and quiet acoustic moments, and reminds one a little of earlier Pink Floyd. Bronzeage, the third single dropped onto this release, is a turbulent, Krautrock-esqe number, with throbbing synthesizer, that morphs into a somewhat experimental alt-rock treatment. One of my favourite tracks on the disc is the spacey instrumental Mexican Cantina (which I might add, doesn't sound anything like what I would expect a Mexican Cantina to sound like). Still, it's a chiller, with eerie guitars, tinkling chimes, alien harmonicas, and spacey drones that finally break out into a slow, acoustic, funk-like jam, without sacrificing any of the quintessential spaced out feel. The CD closes with Voodoo Ray Gun, a heavily reverbed groove, with plenty of that Primal Scream feel to it. The total running time of all seven tracks is 36:57 (pretty much a full-length album, if this were 1970). I could have handled less vocals, and more instrumental passages on 125, and maybe even some longer, more exploratory ventures. The music is interesting enough without constraining it to the length of a (long) single, and the inclusion of vocals at times tends to give an otherwise tasty space rock freak-out more of a pop feel. But then this was just an EP. Lupine Howl have a full-length debut coming down the tubes, and hopefully it will explore more of their experimental side, and less of their pop side. For more information you can visit the Lupine Howl web site. Contact via snail mail c/o Vinyl Hiss; 3rd Floor; 14 King Square; Bristol; UK; BS2 8JJ.